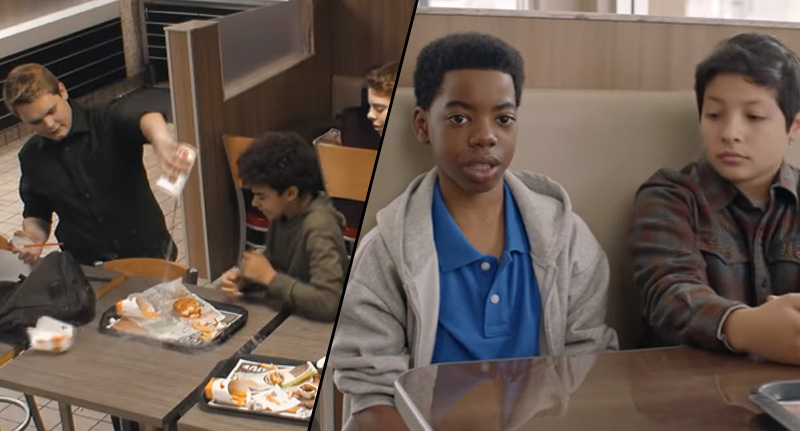 Burger King’s recent anti-bullying public service announcement is actually really eye-opening. They perfectly illustrate the selfishness of our society by revealing how many of its customers reported and complained about their burger being roughed up by a restaurant worker, compared to a real kid experiencing similar treatment. Created in aid of National Bullying Prevention Month, the commercial pits a high school junior against an inanimate burger to demonstrate how people need to be more vocal against bullying. When you see the customers getting so irate their burger has been ruffled up, yet do nothing other than gaze when the high school child is receiving the same treatment, it’s pretty shocking. The fast food chain obviously did an extremely good job of making their point as people on Twitter are hailing it the ‘best anti-bullying PSA’ they’ve ever seen. You may think you’re ‘minding your own business’ by not intervening, but as the end of the clip shows, there’s nothing as good for the victim as when someone stands up for them and they no longer feel defenseless. I think BK have definitely made up for their cardboard nuggets now. To help Burger King spread the word and learn how you can take a stand against bullying, visit NoBully.org.